By grrlscientist on June 28, 2008. This image depicts another of the parrot species that I bred and raised when I lived in Seattle, and that I researched before my NYC postdoctoral fellowship ended. How I miss my lories! Sixth in a series of images of lories by this photographer. 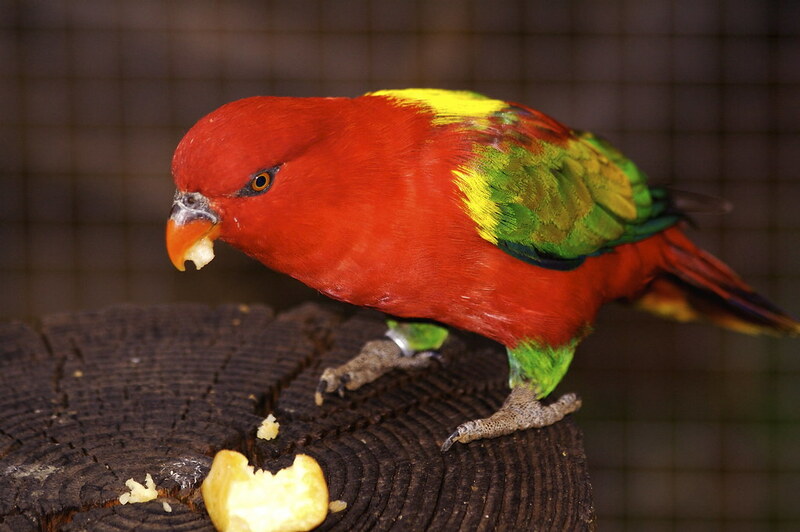 Yellow-backed subspecies of the Chattering Lory, Lorius garrulus flavopalliatus. This subspecies, distinguished from the nominate race by the yellow patch on its back, is found on the Indonesian island of Maluku. It is endangered in the wild. Image: John Del Rio [larger view]. Oh I just luv this spcies of Lory!! It's wings are like a painters pallete...just beautiful!!! I also miss my Blue Streak Lory,Red :o(....Thanks for featuring this pic.! Hang on, that's both a red lory and a yellow loly, err, lory.